2015 marks the ninth year of the Extreme Sailing Series in which it will visits eight venues on three continents, including a return to Germany for the first time since 2010. The grid will this year feature eight teams, representing seven nations. 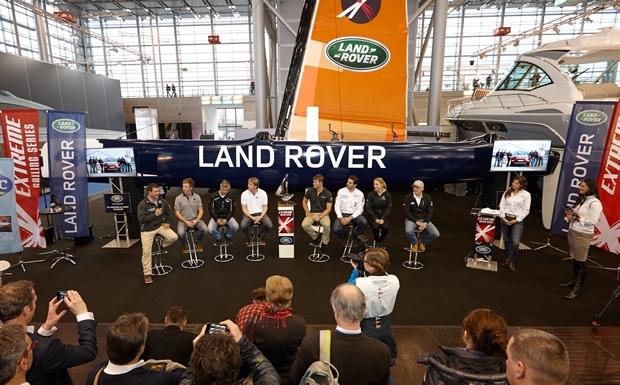 The Extreme 40 skippers and sailors presented today at the Düsseldorf Boat Show. As ever the crew on the Extreme Sailing Series includes Olympic Champions, World Champions and America’s Cup veterans. But the 2015 season will see some new blood coming in, as reigning champions, Alinghi, step back after five seasons from the circuit. The Series will see a new Italian entry - Lino Sonego Team Italia, helmed by multiple keelboat world champion Lorenzo Bressani, while Gazprom Team Russia returns for a second season led by Igor Lisovenko. Oman Air is also back, but at the helm this year is Olympic 49er sailor Stevie Morrison, while Oman Sail will once again field two-time overall Series champions and 2014 runners-up, The Wave Muscat, with Leigh McMillan at the helm. For the opening event of the Extreme Sailing Series in Singapore, supported by Aberdeen Asset Management, Team Aberdeen will be racing for their country as the ‘home’ team skippered by Nick Moloney, who first competed on this circuit in its inaugural year in 2007. For the third successive year, Singapore supported by venue partner, Aberdeen Asset Management, will be the first event of the 2015 Extreme Sailing Series, starting on 5 February. It will be the fourth time the Extreme 40s have raced in Singapore, competing within the confines of the city-centre on Marina Bay. Muscat, capital of the Sultanate of Oman, will host the second event, followed by China’s ‘Olympic Sailing City’ - Qingdao – both these venues have been long-term supporters of the circuit, hosting the Series since 2011. Racing returns once again to Cardiff, moving to an earlier calendar slot in June, before the fleet head to 2015’s new venue: Hamburg, Germany. It has been five years since the Extreme 40s have raced in Germany – and the first time in Hamburg. From Germany, the Series moves on to St Petersburg, Russia’s cultural capital for the second successive season, then Turkey before the Series concludes in Australia in December.